Are manufacturing and mechanical defects solely to blame for damage from Foreign Object Debris? What exactly is the leading cause of FOD and FOD-related incidents? Is it a direct result of mechanical deficiencies, or is it the direct result of workplace complacency? Neither; FOD is the result of both, and sometimes neither at all since FOD encompasses living organisms as well (avian and other wildlife). There are control mechanisms for all of these, but for the purpose of this article FOD events resulting from animals will not be discussed. Inorganic FOD is just about anything, the most common being aggregates (rocks, stones, sand), assorted hardware (rivet stems, bolts, nuts, washers, screws, etc. ), debris (tire rubber), and personal items (coins, pens and pencils, ID cards, phones, watches, glasses). This list is not inclusive and is a small sampling of the most common FOD to be found. Where does mechanical FOD come from? Not an official designation, but mechanical FOD is a way of thinking of any items which come of anything operating on the airside of an airport, and this is a very long list of items. The airside is a very busy place with hundreds of vehicles, tugs, powered and unpowered ground support equipment, and aircraft operating at any given time. It does not take much imagination to consider that represents several million rivets, bolts, washers, nuts, and screws in motion. All it takes is one sheet metal screw or metallic washer to destroy an entire stage of fan blades (or worse). 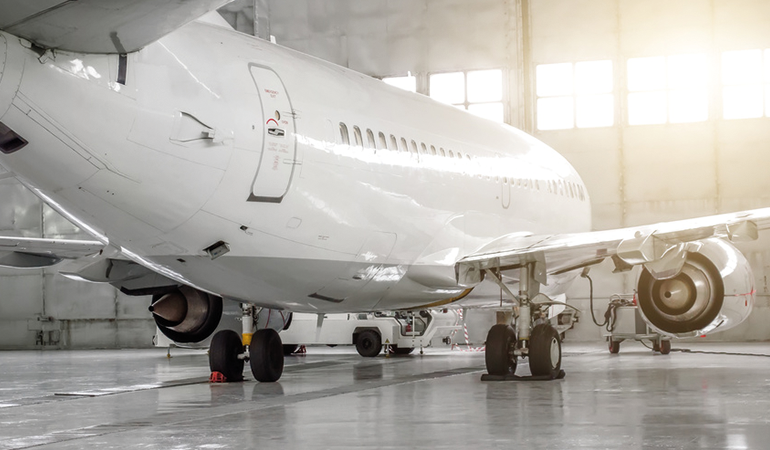 Take into consideration how much stress and vibration airliners are routinely exposed to, and how many tens of thousands of fasteners are on each and the risk is easy to understand. However, ground support equipment poses an equally high risk, maybe even higher, than aircraft when losing hardware. Aircraft are subject to rigorous inspection cycles and thoroughly combed over. Ground support equipment is not held to the same high standard of inspection cycles as aircraft, so while it behooves GSE users to upkeep their machinery, it is not a regulatory requirement at least to the same extent as aircraft. But powered GSE are heavily used and prone to high vibration and prolonged use, in all conditions. They are prime candidates to “donate” FOD to airside surfaces. GSE are built to function well in what they do, which is supporting aircraft ground operations. Ground operations are the day-to-day operations of maintaining and generating aircraft for flights, as well as the servicing which is conducted between flights. Time is money, and there are few industries where this is truer than airlines which routinely schedule turnarounds of an hour or less, regardless of weather. The pace is blistering and relentless. Despite the best efforts of airport staff, it is not possible to monitor GSE as closely as necessary when it is used (and abused) so much. Hardware will inevitably work itself loose of the course of work under these incredibly demanding conditions. Traditional powered GSE (tow tractors and diesel power units) are often built using common industrial power plants and components which are tried and true in the industrial world and do so wonderfully, but loose and lost hardware is not all that significant on most jobsites. Manufacturers choose common building practices and components to keep the price point affordable as well as having a common, robust supply chain. Mitigating FOD damage can be classified in two different types of measures: active and passive. Active controls for FOD are all measures actively taken to eliminate FOD on the airside and landside of an airport. The landside is much harder considering it involves so many roads, storage areas, and lots, but the thing about it is: vehicles routinely transit between the landside and airside, so FOD is brought in as a foreign contaminant. Most airports keep their fuel tank farms far outside of airside operations and truck in the fuel. Fuel trucks alone can account for hundreds of transitions every day. With at least ten tires per truck minimum, that is a lot of FOD potential. Active controls range from very simple and extremely cheap, to elaborate and extremely expensive. One of the most effective FOD controls in each and every airside vehicle is a cloth pouch, waste bucket, or even a used plastic coffee can marked “FOD” for storage, and using a paint can key to pry debris from tires (coffee cans need to be plastic if used as a FOD bucket since a metal can poses a high FOD hazard in itself). If the coffee can is used, the cost is about $0.50 for the paint can key, and nothing for the coffee can (everyone drinks coffee in airport operations). Vehicle mounted magnetic bars. These are common on ops vehicles and tugs, employing a very strong bar magnet which picks up ferrous metal (steel) which is what almost all rivets, bolts, nuts, and washers are made from. A very useful active measure to find and control metallic FOD. Unfortunately, any gap strips or airframe pieces will not be picked up since they are constructed primarily from aluminum. Rumble strips might still be in use at some airports, but they have proven to be less effective than getting out at FOD stops and checking tires for FOD by hand and eye. Friction mat sweepers are a mat which employs bristle pad to sweep up FOD into scoops and pouches. These are excellent tools and do a wonderful job of collecting FOD of all small sizes, from small aggregate to nuts and bolts. Mechanical systems are, as the name suggests, mechanized devices which either sweep, vacuum, or blast FOD from the pavement. These can all be valuable tools, but they have limitations. The powered, mechanical systems are very strong and unless they are a vacuum, have a tendency to push more FOD into other areas of the airport negating any good. Surveillance and ground radar systems for FOD are not the norm and are reserved for high-volume, high-revenue airports; they are expensive. But the threshold to entry is well worth it for airports which see hundreds jet movements per day, and each movement is a potential multi-million dollar FOD event. Passive control measures are developing and following a training plan for all workers. Any single person who touches an aircraft movement area must understand the dire consequences of complacency in lost tools, personal affects, catering supplies (a dinner fork will take apart a jet engine with ease). The sources of FOD are endless, but making employees aware of their surroundings goes a long way in an effective FOD prevention program. Much of the equipment used in airside ground operations are derivatives of commercial or agricultural machinery, namely tractors. In fact, farm tractors are commonly found doing a number of roles at many airports including snow removal and aircraft ground movement because they are a very versatile platform which most airports already have on hand for grass cutting. But they are not tailored for the airside environment. A great place to start is getting the right tool for the job. Buying an aircraft tug designed specifically for the job is important, and the availability of a sealed machine is a wonderful safety asset. Electric remote-operator tugs are incredibly smooth and have practically no vibration present during operation. They are low profile and compact with the operator standing by, able to inspect the entire operation, but also allowing them to observe the tug at any given time. Removing a tow bar eliminates a big source of FOD hazards with the dozens of fasteners, pins, and latches on an average tow bar. Remote tugs are designed to stop instantly, so if the operator notices FOD on the movement area, he can cease operations instantly. Also, the operator is not tethered to the aircraft tug and driver, and with Bluetooth maintenance headsets becoming so common, he removes yet another FOD hazard from the equation. FOD control is a curious blend of the old and new. Emerging and developing technologies are making FOD detection better than ever; robotic and remote control technology and highly efficient battery power are changing the GSE landscape with better, safer, FOD resistant machines. Yet, it still comes down to the everyday worker to get out of their vehicle and pull the rocks out of their tire tread, and the flight attendant to make sure all of her hair metal hair pins are accounted for. The adage that “FOD is everybody’s business” is not cliché; it is an accurate way of life, and a way of life which can save lives. You want to prevent Foreign Object Damage by implementing the right GSE? Get in touch with us today and get to know our wide range of machines!